I've said it before and I'll say it again: the thing that irritates me most about the Yankees these days is the breathtaking lack of accountability. Hal Steinbrenner is content to keep incompetent knuckleheads like Brian Cashman, Randy Levine and Lonn Trost in high positions, and never fires anybody. Mediocrity and failure is never punished. So now the $230 million New York Yankees are officially out of the postseason race, but I will be surprised if anybody loses their job over it. Heck, forget about playing baseball for a second -- this team cannot even correctly manage a promotional giveaway, something Single A minor league teams can do with ease. And yet they all think they're so wonderful and competent and smart. Good grief, as Charlie Brown (last night's bobblehead) would say. What hand were you dealt, Jason? Your team left no wiggle room for anything to go wrong with the delivery. That is a "you" problem, not a "we" problem. To top it all off, you all couldn't even figure out how to properly distribute the bobbleheads when they did arrive. Instead of handing them out after the game, you had one bottlenecked spot, where people waited as long as seven innings to get their bobblehead. 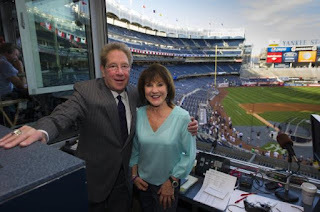 To top it all off, the rich people in the Legends seats didn't even have to wait on line -- Yankee staffers personally brought them their bobbleheads, something Zillo professed not to know about. But this screwup is the Yankee way, the way the organization was surprised that A-Rod needed surgery, and that a 39-year-old shortstop might not be 100% on Opening Day. Wally Matthews of ESPN New York wrote a great column on the issue -- he tried to interview Levine and Trost, but wouldn't you know it, they didn't want to talk. Anyhow, the Yanks are a mess, but as long as the money keeps on rolling in, don't expect Hal to make any changes. In fact, I'll bet the big shots in this organization will throw themselves a big ol' party after the season, is over to celebrate a job well done. Accountability is for suckers. Here's the scoop. A few weeks ago, I bought a ticket to last night's game for Section 418, between home plate and first base, but very high up -- it cost me a little over $37 when you figure in service charges. Anyhow, I got to my seat about a half-hour before the game, and I saw a very curious announcement. The Yankees ran an ad on their scoreboard which said that if you had an AT&T phone, and went to Section 331, you could exchange your current seats for field-level seats. I do (it's a "dumb phone," as I lost my iPhone on the subway, and am waiting to get a new iPhone later this month, but my dumb phone is all AT&T! Needless to say, I left my seat as fast as I could and moseyed on down to Section 331 to see what was what. I expected a torrent of people, but there were only a few folks ahead of me. So I asked the AT&;T folks, "What's the catch" about these tickets? Turns out there really wasn't a catch -- just had to show them my phone and give them my mobile number. Now, unlike the moat seats, no free food was included. But they did have waiter/waitress service to bring food to your seat, which was cool. What wasn't cool was that the food was as lousy as ever, but I digress. Anyhow, this is arguably the most fan-friendly idea the Yankees have *ever* been a part of in my lifetime, and I am more than a little surprised that more people didn't take AT&T up on their generous offer. I have never gotten such a great view at a Yankee game ever, and the fact that I got it for the price of nosebleed seats makes it all the sweeter. Oh, and the field-level seats are cushiony and comfortable, too! Sweet! I have no idea how long this promotion has been going on, but it's a great idea. It fills up prominent seats with passionate fans, and gives them a great experience. Talk about a win-win! With the great seats I had, it's too bad, of course, that the game has such a lousy outcome, and the Yanks didn't win-win! I will squawk on that tomorrow, but suffice it to say that I didn't lose hope after a five-run deficit, but I did lose hope (and scream "Noooo!) after I saw that Joba Chamberlain was coming into the game! Are the New York Yankees really in it to win it? Finally, this team is acting like a playoff one – and so is Joe Girardi, who is finally making the moves you need to make if you want to see this team make it into October. Fortunately, the Phil Hughes Experience is coming to an end, which is good news for Yankee fans who actually want to see their team win and not be knocked out of the game by the second or third inning. Hughes is leading the league in one thing this season – the most games where he was knocked out before the end of the fifth inning! It was shocking to me that Girardi had him start the game against the Chicago White Sox on Monday, given that pretty much every game is a must-win these days. Why put your team out of it by putting Hughes as the starting pitcher? Fortunately, the rain cooperated, and kept Hughes from finishing his start, which gave the Yankees the chance to put up that epic eight-run inning, the inning White Sox broadcaster Hawk Harrelson said was the worst he had ever announced. Anyhow, David (I nearly wrote Aubrey) Huff is starting against Boston this weekend, which at least gives the Yanks as good a chance as any to win. Hooray! I was also pleased last night to see that Mo was brought into the game in the eighth inning when David Robertson couldn’t get out of a jam. With so few games left, every single one is a must-win, and I am glad Girardi took action instead of watching the lead totally disappear. Besides, it’s not like the Yanks have to keep Rivera fresh for next year – this is it. I try to find good in every Yankee, but it is very hard with Joba these days. IMHO, he should have been DFAed after his trampoline disaster. You know what you need to know about Chamberlain as a person? Pretty much every single team and opposing player to face the Yankees this year has said or done something to honor Mariano Rivera, from all the gifts he had received, to the reaction of the players on both teams at the All-Star Game. Even Squawker Jon was on his feet when Mo came into a Yankee game we attended earlier this year as a sign of respect. Yet Joba gets into a squabble with Rivera in front of reporters, telling him not to shush him when he was being a loudmouth. It takes a special kind of jerk to be against Rivera, but that’s our Joba! Anyhow, after Sunday’s debacle, when Joe Girardi actually thought it was a good idea to pitch him in a close game, I never want to see Chamberlain in a game for the Yankees again. Enough already. At the very least, it appears now that Girardi will not ever put him in an important situation again. Nor should he. I will be at the game tonight, to see the first of the four Yankees-Red Sox games in the Bronx this weekend -- will watch the other three games on TV. This is the first time in a while that the games have any real buzz – partly due to the standings, and partly due to Ryan Dempster. Incidentally, if the Yanks win the World Series this year, should they cut Dempster a playoff share? I am wondering if David Ortiz will gets plunked tonight. It will be interesting to see what happens!